This is a report on a workshop held at The University of Tokyo on designing mobile user experiences at the Zoo. The workshop, which was planned and coordinated by Claus Østergaard (visiting Ph.D.-candidate of Shin Mizukoshi lab from Aalborg University, Denmark), Shin Mizukoshi and Ryo Yoshikawa (Master student of iii at The University of Tokyo), was held on December 5th 2012 facilitated by Claus Østergaard and Ryo Yoshikawa. The workshop had two goals. First of all the workshop aimed at giving the participants insight into the aspects of user experience of mobile devices at theme parks and zoos. Secondly the workshop functioned as empirical data for the workshop facilitator Claus Østergaard. The workshop was divided into two parts. The first part focused on experiencing an existing mobile solution at a nearby Zoo. The second part focused on designing the concept of a new smartphone app for the Zoo. In the morning the participants and facilitators meet at Ueno Zoo, Tokyo, as Ueno Zoo have a “Portable Information System” (from now on PIS). The participants was divided into two groups consisting of three participants, and the goal was to let the participants experience the PIS on their own as these experiences would be used in the second part of the workshop. During the test of the PIS the two groups was observed by the workshop facilitators who documented the groups’ behavior and interaction with the PIS. After the test the participants’ experiences of the PIS was discussed in plenum. Based on the visit to the Zoo and earlier experiences of visiting Zoos, the participants were asked to draw a customer journey of their visit. The focus of this exercise was to identity the users’ good and bad experiences during the visit. The participants each drew their own customer journey after which the participants were organized into the same groups as they were in Ueno Zoo. The participants were then asked to choose 2-4 bad experiences based on their customer journeys, which they all could agree on. After drawing the customer journeys Claus Østergaard gave a presentation on user experience of mobile apps for theme parks, museums, zoos etc. based on research and existing theories. Then he presented a framework for designing mobile user experiences for zoos. The framework was divided into six areas of focus, which the participants should focus on during the process of designing the new smartphone app-concept for Ueno Zoo. Besides explaining each of the six areas of focus each area consisted of a small exercise, that the participants could do in order to get inspired to work on the concept. The participants were asked to convert the earlier identified 2-4 bad experiences in the zoo to good experiences by designing a smartphone app-concept for those situations based on the framework. When the participants had designed the concept of the new smartphone app for the zoo, they were asked to draw a mock-up of the different screens of the app on large A3 paper. During this process they had to constantly take into consideration the social and physical contexts of the given usage situations, as this affected the visual look of the different screens of the app. The participants then presented their concepts including their identified bad experiences in the zoo. After the presentations the two groups and the facilitators reflected on the value the apps would give to the visiting experience. They also reflected on the overall process and methods used during the workshop in order to get a deep knowledge about the value of such kind of workshops. Shin MIZUKOSHI will attend an interesting conference on mobile media and learning to make a presentation about…something (still under construction haha): the evening of Oct 13, 2011 #Mobilityshifts: An International Future of Learning Summit at The New School in NYC. He will also back to his dear places in Manhattan. Japan Society lecture on Mobile and Social Media, “Keitai Kids: Youth, Culture and Social Media in the USA and Japan”, 19:00-20:30, Oct 11 NYC. Tomi Ahonen and I will make presentations and discussion moderated by Trebor Scholz. It is a part event of the New School’s MobilityShifts conference. 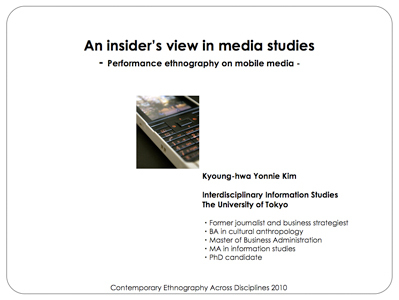 ・ KIM, Kyoung-hwa Yonnie, “An “insider’s view” in media studies: Case analysis of performance ethnography in mobile media studies“, Contemporary Ethnography Across Disciplines, Nov. 2010. On the 25th March 2011, Alexandre Fleury, a visiting graduate student from Aalborg University in Denmark, organized a workshop investigating the convergence between television and mobile phone. Twelve participants first explored what makes the two devices important to them by: Pointing at the emotions they would experience without a TV and a mobile phone; associating adjectives to each device; and naming functions they felt was essential for each device. 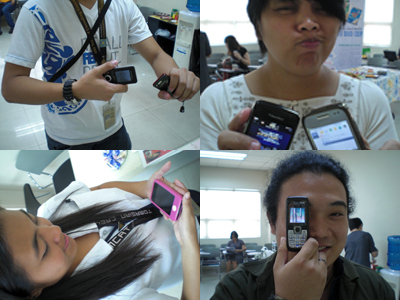 The participants then generated creative scenarios involving their own experiences from both media. By integrating the functions they identified previously into unusual real life situations, the scenarios illustrated not only what makes the two media so vital to modern life but also how to use them simultaneously. Furthermore, the participants merged their personal scenarios in groups, creating more elaborated stories involving TV and mobile. The groups then acted out their story, enabling reflection and feedback from all workshop attendees and facilitators. When asked simply, the most important functions of TV and mobile phone mentioned are unsurprisingly related to accessing information and communicating with peers. However, it is interesting to study how these basic functions gradually evolve when transposed to unusual setups. If some functions keep their original purpose, some become insights of what may be the future of converged media. Finally, it should be noted that during the workshop, all group performances referred to an emergency or tragic situation. This unfortunately illustrates the timing of the workshop, only 2 weeks after the disaster of March 11th. Kyounghwa Yonnie Kim, a member of MoDe, had a presentation at Contemporary Ethnography Across the Disciplines held in Hamilton, New Zealand on 19 November. The title of presentation was “An “insider’s view” in media studies: Case analysis of performance ethnography in mobile media studies” where the methodological achievement of MoDe project was reported as a new interdisciplinary approach in media studies. [Presentation abstract] One of emerging issues in media studies is how to develop an integral methodology to describe a digital media phenomenon, whereas conventional methods such as a large-scaled survey and statistical analysis encounter difficulties in their attempts to address multiply contexts of the use of digital devices. 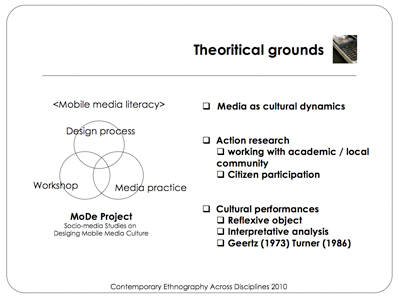 This paper reflects on performance ethnography as a methodological perspective to investigate digital media, looking specially at the cultural practices of mobile technology. After a brief discussion on recent attempts to introduce new approaches in investigating multimodal and highly personalized mobile media, this paper will present case analysis of performance ethnography workshops conducted in MoDe project. Finally it will suggest an emic framework, that is to say, “insider’s view” as a possible new perspective in media studies, thus, to clarify potential contribution of performance ethnographic methods to the study of digital media. On Oct 23rd, 「What is Keitai?」 workshop was held at the 21st floor’s meeting room of civic center of Bunkyo district office. As a part of a co-project of Bunkyo district and the University of Tokyo, MoDe research team in cooperation with KDDI R&D Labs designed and conducted the workshop. The basic program of the workshop was following Mode’s “Keitai storytelling WS“, however, we introduced a set of mini lectures before and after the storytelling activity so that participants will be able to reflect mobile phones in both dimension of culture and technology. Dozens of Bunkyo district residents participated in the workshop. To our surprise, the majority of participants was senior citizens in their 70’s which was beyond our imagination. Prof. Mizukoshi opened with introduction and explanation of workshop program, then Yonnie Kim made a short lecture on mobile phones in foreign countries. 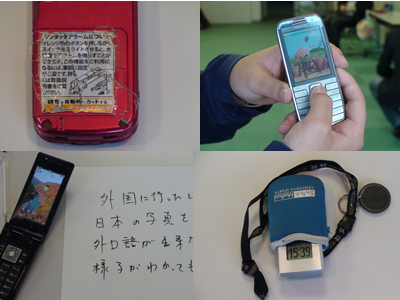 Then participants divided to groups of 5~6 persons, illustrated their own experiences surrounding keitai. Then, they moved to a photo booth and had a single part of their keitai taken a picture, which describes their own story well. Overall presentation was followed. After this activity, Mr. Niida Sumaru made a final lecture on technological issue of mobile phones. Because of the demographic of participants, the storytelling remarkably tends to relate to inconvenience of terminal or misunderstanding of its function, etc. Since many activities regarding keitai have focused on youths’ usages, media usage of senior people have been rarely addressed so far. In this sense, the workshop was very meaningful in consideration of the future of information society. Yonnie Kim, a member of Mode, conducted “Performance ethnography of mobile phones in Shanghai” workshop on Sep 24 in Shanghai. Eight Chinese youngsters in their twenties participated in the workshop held in urban area of the city. The workshop was consist of two parts. The first part of activities was a storytelling about experiences surrounding their own mobile phones, whose detailed program is originally from “My keitai storytelling WS” of Mode. Accordingly, participants in Shanghai asked to choose a single part of their own mobile phones and then had a presentation about their choice. 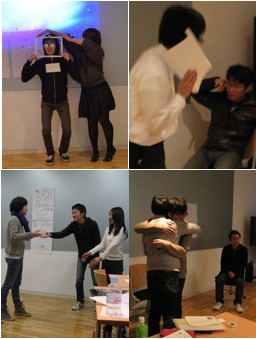 The second part was “Acting a typical mobile landscape of Shanghai”, the cross-cultural revision of “Acting a typical mobile landscape of Seoul” WS in 2009. Participants finally made two short skits about a mobile landscape of Shanghai, where an enthusiasm to savor mobile entertainment was well described.